IsoChill (Double Cold-Temperature Processed Cross-Flow Full-Spectrum Premium Microfiltrated Whey Protein Isolate), Colostrum, Glutamine Complex (Glutamine Peptides, Glutapure Glutamine, N-Acetyl L-Glutamine), SI Complex (Alpha Lipoic Acid, d-Pinitol, 4-Hydroxyisoleucine), D Complex (Protease, Lactase), Lactoferrin, and Soy Lecithin. Mix 1 scoop in 6 ounces (177 ml) of cold water or non-fat milk. Consume 1 to 4 servings per day (depending on your protein requirements). For best results, consume 1 serving immediately after you workout. 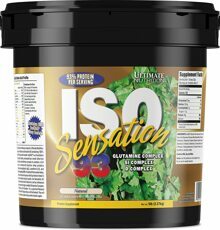 Ultimate Nutrition is proud to release Iso Sensation 93 containing 100% IsoChill Whey Protein Isolate. IsoChill is a functional whey protein isolate, processed by a novel ultra-low temperature microfiltration process to contain a full balance of undenatured bioactive whey proteins including immunoglobulin (IgG), lactoferrin (Lf), and glycomacropeptide (GMP). It is derived from sweet whey, membrane-filtered and spray-dried by indirect heat to ensure the highest product quality. This unique formula is further enhanced with colostrum. Colostrum has long been considered nature's first food. This pre-milk substance supplies nutrients and other necessary biological elements and activates and regulates numerous immune, growth, and repair processes. However the benefits do not stop at birth! Numerous studies have shown that colostrum continues to exert important biological activities when given to adults. As our bodies age, we produce less of the immune factors needed to maintain optimal health. Supplemental colostrum can help replenish these stores. 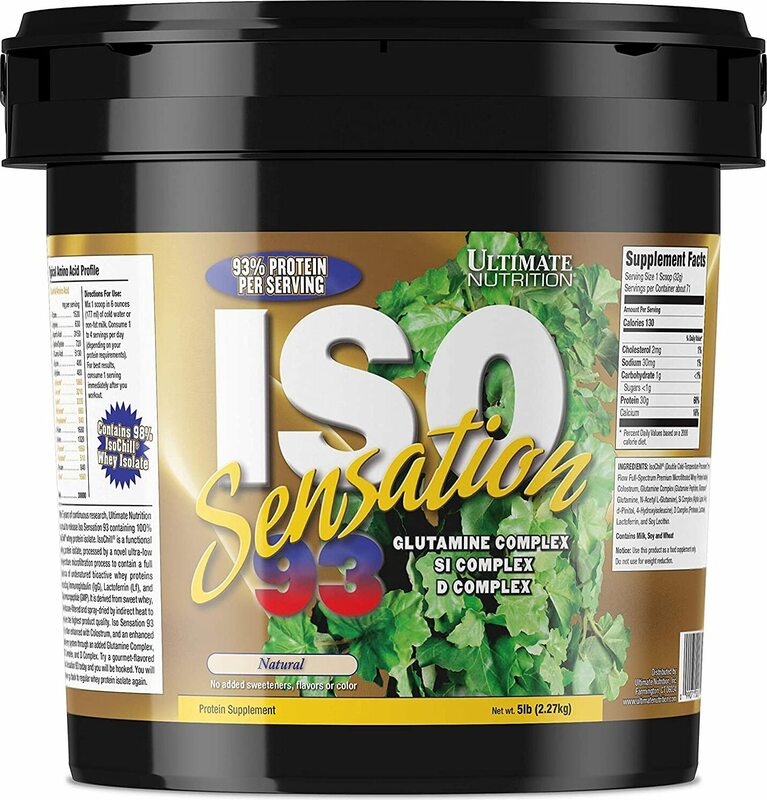 Iso Sensation 93 also includes an added glutamine complex. In times of stress, (weight training) certain parts of the body demand so much glutamine that the body can’t manufacture enough. In these instances, glutamine supplementation could make a world of difference. Intense training causes muscle cell glutamine levels to decrease, allowing for muscle breakdown. Supplementation of L-glutamine causes an anti-catabolic effect by keeping these levels elevated, thus preserving muscle mass and improving nitrogen balance. We’ve combined the most stable and readily absorbed forms into our complex. Being easily absorbed and bioavailable, peptide-bonded glutamine, N-acetyl L-glutamine and glutapure enter muscle cells fast, break down to free glutamine, and perform essential metabolic functions. Optimizing insulin metabolism can support the muscle-building process. Our SI complex includes alpha-lipoic acid, d-pinitol and 4-hydroxyisoleucine. These ingredients are effective in improving insulin efficiency and sensitivity, and copying insulin's effects on muscle with another molecule altogether. A greater uptake of blood sugar by muscles could lead to enhanced glycogen synthesis and ultimately greater gains in lean muscle. In the end, they all favor better uptake of creatine, glucose and amino acids, and they enhance muscle recovery and growth without excess sugar use. Finally, our enhanced delivery system includes D complex: a blend of the digestive aids protease and lactase for superior digestibility, ensuring maximum absorption and utilization of the nutrients in this formula. These enzymes contribute to the health of the digestive tract and can increase the utilization of whey protein. Try a gourmet-flavored Iso-Sensation today and you will be hooked. You will never go back to regular Whey Protein Isolate again. Banana Ice Cream This is a Buy 1 Get 1 FREE offer! Cafe Brazil This is a Buy 1 Get 1 FREE offer! Chocolate Fudge This is a Buy 1 Get 1 FREE offer! Natural This is a Buy 1 Get 1 FREE offer!